When I first got dressed today, I felt like a hippie / cowgirl hybrid with my big, bell-sleeved sweater and skinny jeans with Western boots. Once I ventured outdoors, I piled on more items in an attempt to stay warm and became a hodgepodge of style. 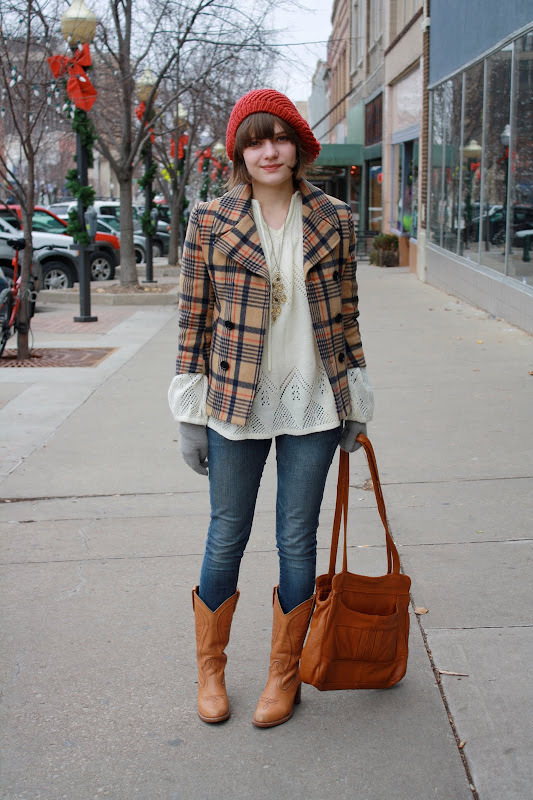 I love the plaid jacket and the brown accessories. Somehow it all comes together in a neutral way and the colors don't seem overpowering at all. So chic! Love that hat! I just bought one similar to it today but in navy. I love those cowboy boots. I've been obsessed with finding the perfect pair for a while now. Its practically impossible but I love those. Fabulous style though!! Love the jacket and boots... esp. together, unexected. I love your jacket so much! Gorgeous! I love all the thrown together style, it totally works! I think the hippie/cowgirl hybrid must be one of my favorite style mashups. And the addition of the plaid jacket and hat is so perfect. Love this outfit! your new hair is fabulous and it looks great with hats! Great way to stay stylish and warm!! I think this is one of my (many) favorites! I love how this turned out. It's totally you and yest very Parisian meets hippie. The hat looks adorable and I love the sweater peeking out of the coat. Awesomeness! I'm loving the festive little street you have been shooting on! adorable! I love combining looks like this! What's on your pendant? It looks beautiful! I love the colors, tans, cream, and reds! what a great outfit! I love how everything goes so well together. and that sweater is adorable. Love the plaid blazer with the beret!! You look perfectly dressed for this cooler weather. Just started following your blog recently and I am loving your style!! I'm so jealous of your ability to throw things on and look so amazing. The plaid jacket is my favorite part. The jacket is amazing and goes really well with your top! I love it! You have an awesome ability at putting outfits together. Love this outfit! SO adorable as always. i don't think i've commented on your hair yet. and i do like that hippy sweater very much! You look great. ;] I like the blouse the most. Nice look! the red beret really tops it off nicely!